As many as 30% of people with psoriasis also develop psoriatic (pronounced sore-ee-AA-tic) arthritis, causing swelling, stiffness and pain in and around the joints. It can affect the joints of the fingers, wrists, toes, knees, ankles, elbows and shoulder joints, the spine and joints in the lower back (called sacroiliac joints) as well as the tissues surrounding the joints, including tendons and ligaments. It may cause a swelling of the whole digit called “sausage” finger or toe. There may also be skin inflammation, particularly on the elbows, knees and scalp. Psoriatic arthritis most commonly appears between the ages of 30 and 50, and affects men more than women. Your genes, the immune system and environmental factors are all believed to play a role in the onset of the disease. In 85% of those with psoriatic arthritis, skin disease (psoriasis) preceded joint disease, but not everyone who has psoriasis will develop psoriatic arthritis. Without treatment, psoriatic arthritis can potentially be disabling, so it is important to be aware of the signs and see your doctor as early as possible if you have any symptoms. Unfortunately, there is no specific test for psoriatic arthritis. Diagnosis is based mostly on symptoms, examination, x-rays and the elimination of other types of arthritis. If you have psoriasis and experience persistent joint pain, you may have psoriatic arthritis, and your dermatologist or family doctor can refer you to a rheumatologist (a doctor who specializes in arthritis) and can provide further evaluation and/or a diagnosis. Disease-modifying antirheumatic drugs (DMARDs) may relieve more severe symptoms and attempt to slow or stop joint/tissue damage and the progression of psoriatic arthritis. One of the most commonly used DMARD medications is called methotrexate. PDE4-inhibitors–Otezla is inducted for psoriatic arthritis. Biologics such as Cosentyx (secukinumab), Enbrel® (etanercept), Humira® (adalimumab), Remicade® (infliximab) and Stelara® (ustekinumab) are also considered DMARDs. They are highly selective agents that target specific parts of the immune system that cause psoriasis and psoriatic arthritis. 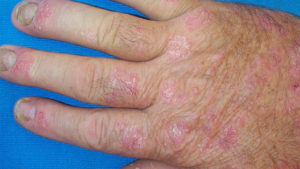 For more information on psoriatic arthritis and other rheumatology resources, visit RheumInfo.com.